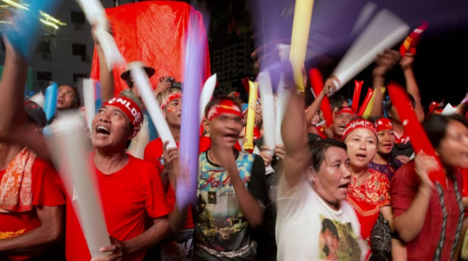 Supporters of the National League for Democracy (NLD) celebrating the successful election (Image Source). When your country has its first successful democratic election in 63 years, and the successful candidate is Aung San Suu Kyi, a Nobel Peace Prize-winning, Human Rights Champion, you naturally want to jump and scream in the streets with joy. And, in November many people did just that as they celebrated a huge success in Myanmar’s transition towards a freer society. However, even in light of this amazing result, we see a slow tip-toe out of oppression. Much is lingering of the military-backed despot government and the society it enforced in Myanmar since 1962. This article will discuss that the atmosphere of oppression cannot quickly dissolve. As seen in the sentiment from the National League for Democracy (NLD) officials and their actions, it appears that they are still treading lightly in their path to change. Free expression cannot lay its foundation haphazardly on oppression, just like democracy cannot be built overnight. Because oppression is systematically reproduced in major economic, political and cultural institutions, it cannot be eliminated by a change in power. This is why the NLD strategy for change has focused on pragmatic action, acknowledging the de facto power of the Union Solidarity and Development Party (USDP), the successor of the old military party. The most striking and unsettling example of the inability of the NLD to kick down oppression is the lack of acknowledgement of the abuse of the Rohingya, a Muslim ethnic group in Myanmar. A recent Yale Law Schoolpublication has suggested that, “assuming their information accurately reflects the Rohingya’s situation, [they find] strong evidence that genocide is being committed against the Rohingya.” The report says that the Rohingya have “been denied equal access to citizenship,” that the state has “perpetrated violence against the Rohingya” and has deprived them of “freedom of movement and access to food, clean drinking water, sanitation, medical care, work opportunities and education.” The NLD ran their campaign without acknowledging this issue. This tactic was used to not polarize their voters; of whom many have not openly contested the treatment of the Rohingya. Feeling the necessity to ignore a human rights issue in order to triumph politically is a strong example of the power forces at play in Myanmar. If the NLD has to play by existing power rules, can the general public show dissent? A loosening of the rules surrounding free speech has occurred since 2008 when a new constitution was proposed to make-way for a democratic government. These constitutional changes can be seen, partly, as a response to public dissent and international criticism of human rights abuses. In 2007, an estimated 10,000 Buddhist monks marched in a peaceful pro-democracy protest with thousands of domestic and international onlookers. They highlighted the demand for non-violent democratic change in Myanmar. However, it does not appear that public dissent towards the military is widely tolerated even in light of the officially more open government. In March 2015, the military aggressively cracked down on a peaceful protests, beat participants and arrested 100 people. A freer society is indicated by the proliferation of journalism in the country since 2008. But there have been recent instances of journalist being imprisoned for publishing articles criticizing the military or USDP and there is still a media regulatory board in place. It is expected that self-censorship is still being practiced amongst the population. Overall, the legal situation in Myanmar is opaque as there is “no single location, institution, or individual person that can provide access to the country’s entire legal database.” This makes it hard to figure out what the law is and to verify that it is being enforced. Increased transparency will go a long way to make the public more confident in the ability of the NLD to practice good governance and apply law impartially. It will be interesting to witness how, in the next few months, the NLD forms their government and starts to break down the existing power structures. Most intriguing will be the handling, domestically and internationally, of the extreme human rights abuses against the Rohingya, and how public opinion responds. Perhaps soon the NLD can stride confidently, but for now, acting pragmatically is probably the best way to move forward in the treacherous landscape of building democracy.